This blog includes specific instructions of how to fill in the field parameters of the Primo search API as well as tips of where to take them from for your specific case. 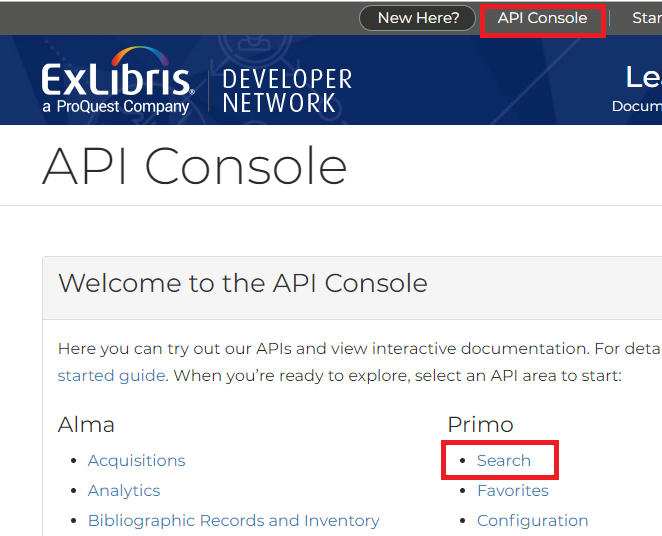 The Ex Libris Developer Network allows a user to test APIs with read-only functionality (GET) even while not logged in to the developer network. 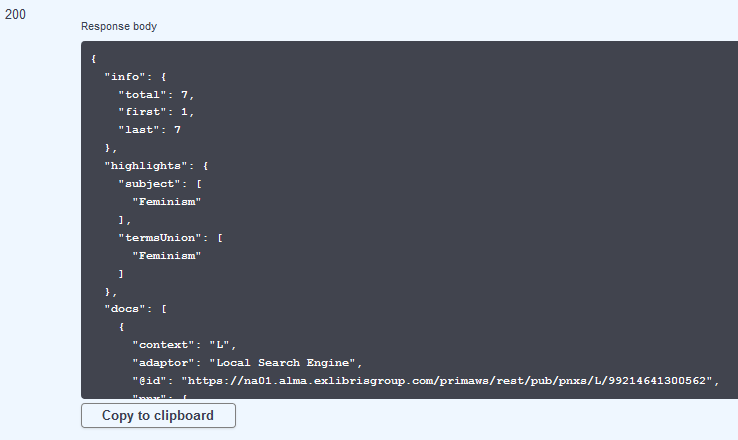 In this example we will use the API console as a guest to run the Primo search API. A table below is provided to assist in using the Primo search results URL to construct the exact desired syntax of the API call. The above search results in the following Primo URL. We are putting here the URL because it helps in later identifying the values to be used in the API console. The query string for the search. "Five famous French women "
"viii, 304 p.,  leaves of plates : ill., 23 ports. ; 20 cm." "Fawcett, Millicent Garrett, Dame, 1847-1929.$$QFawcett, Millicent Garrett"
"London ; New York : Cassell"
"National American Woman Suffrage Association Collection (Library of Congress)$$QNational American Woman Suffrage Association Collection (Library of Congress)"
"London ; New York :"
"Five famous French women / by Mrs. Henry Fawcett." "Fawcett, Millicent Garrett, Dame, 1847-1929." "The equality of women : a Catholic view "
"Feminism -- Religious aspects -- Catholic Church"
"1 online resource (15 p.)"
"Hawks, Mary G.$$QHawks, Mary G."
"Huntington, Ind. : Our Sunday Visitor"
"equality of women : a Catholic view / by Mary G. Hawks." "The equality of women : a Catholic view"
"The essential feminist reader "
"xviii, 472 p. ; 21 cm." "New York : Modern Library"
"Freedman, Estelle B., 1947-$$QFreedman, Estelle B." "essential feminist reader / edited and with an introduction by Estelle B. Freedman." "Includes bibliographical references and index." "Women and the French tradition"
"234 p. front., ports. 20 cm." "Ravenel, Florence Leftwich.$$QRavenel, Florence Leftwich." "Preface.--The eternal feminine.--A woman critic of women [Aryède Barine]--A law unto herself [George Sand]--The great salonière [Mme. de Staël]--The great tradition [Madame de Sévigne]́--The riddle of the sphinx [Mme. de Lafayette]--Great women's daughters.--Women of France." "Women and the French tradition [by] Florence Leftwich Ravenel." "Women of the French revolution"
"Whale, Winifred Stephens.$$QWhale, Winifred Stephens." "London, Chapman & Hall, limited"
"Women of the French revolution, by Winifred Stephens." "Women's rights -- Great Britain"
"262 p.,  leaf of plates : 1 port. ; 17 cm." "London : Collins' Clear-Type Press"
"feminist movement / by Ethel Snowden." "5 p. l., -212 p. front., ports. 16 cm." "London, New York etc. H. Milford, Oxford University Press"
"World's classics ; 248$$QWorld's classics "
"Mademoiselle de Corday.--Madame Roland.--The Princess de Lamballe.--Madame de Genlis." "Four Frenchwomen, by Austin Dobson." "H. Milford, Oxford University Press"